You’ve probably all seen the television adverts for an Amigo Loan, even if you haven’t taken in what they are for. Guarantor loans, such as the ones by market leaders Amigo, are pitched as something that can improve your credit, help you get out of cdebt, and something your best mate can help you out with with no impact on either of you. This is all rubbish! No matter how they are sold by the financial services industry, guarantor loans are a terrible idea for a number of reasons, some of which I will go through here. They can’t be that bad? I have such strong feelings towards guarantor loans because I believe that they prey on people with poor credit historys, with high (although not the highest on the high street) interest rates. They are manipulating people into believing that it’s a quick, easy and painless way to help a friend or relative out of their financial position, when it couldn’t be farther from the truth. There are far cheaper and more sensible approaches to improving your credit score and getting credit without risking someone else’s financial future. Whilst for the person borrowing the money, a guarantor loan might seem to be a much cheaper way of getting credit thank something like a payday loan, if people already have a poor credit history, why should someone else risk their credit and finances for them? I’m a big fan of the TV show “Can’t pay, we’ll take it away”, I know that this is a controversial thing to be a fan of, and of course I don’t like it when genuine people have fallen on hard times and are having items or even their homes repossessed, however the people who think that they can get away with not paying their debts just because they don’t want to amuse me no end, and I love it when they are taken to task. There are (as of today) at least 5 episodes of the show where people who have been a guarantor for someone else’s loans or lines of credit have been pursued by the High Court Enforcement Officers as being named as a guarantor has meant their name has ended up on a high court writ for that money to be recovered. These people thought they were just signing something to help their friend or relative get credit, they never thought their friend or relative would default and they certainly never appreciated that they would be liable and end up being hunted down by enforcement agencies. 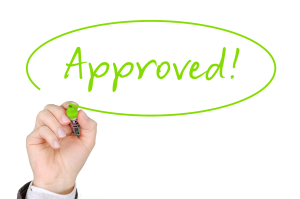 Now in these episodes, not all of them are guarantor loans such as someone having taken out an Amigo loan or other providers such as TrustTwo or Buddy Loans, but they have in some way shape or form ended up as a guarantor to a line of credit. The episode which sticks out to me the most is the retired couple in season three episode 8 who had acted as a guarantor for their daughter’s rent. The daughter had defaulted and the parent’s were contacted to pay the default. Being retired they didn’t have the money, so they called their daughter to sort it out and she could not have cared less. The way the episode unfolded meant you could have nothing but sympathy for the parents and I genuinely believe this ripped the family apart – with other family members coming to their aid but being upset with the daughter’s behaviour and attitude. I have to be honest, that is one of the hardest episodes to watch out of all the ones I have seen. Financial services products such as an Amigo Loan or similar prey on that friendship or family bond. Who wouldn’t want to help a friend or loved one? Unfortunately, as I have learnt through various stages of my life, when money is involved, all bets are off and there are very few people you can really trust. Whether it is intentional or not, money complicates things and can bring out the worst in people. I bet the family in the episode of ‘Can’t Pay, We’ll Take it Away’ that I mentioned earlier never in a million years thought their daughter would turn on them so nastily when asked for the money, or even that it would ever come to that in the first place. That’s why I would implore anyone who is considering being a guarantor to really consider what other options there are to help their loved one first. Equally, I would suggest that someone considering asking someone else to be a guarantor for them to consider any other option first too. 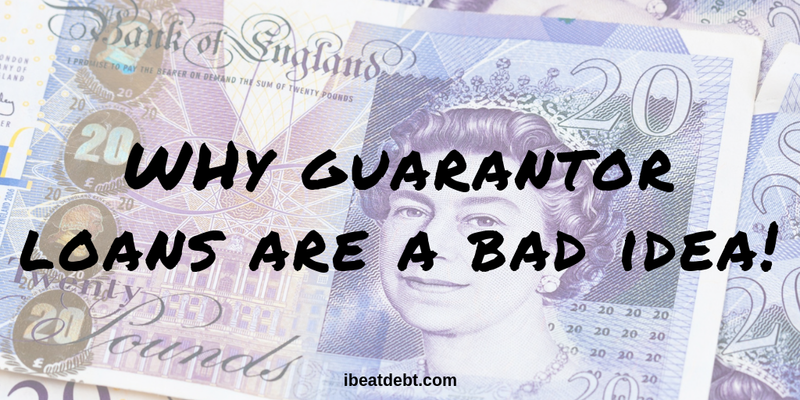 You should certainly never ask someone to be a guarantor if they can’t afford the repayments. You may have the best intentions at heart but imagine if you lose your job or your circumstances change and you end up in debt, a debt management plan can’t work with this kind of loan, because your guarantor is liable and so the creditors will just go after them. Sara from Debt Camel has written a great post about guarantor loans and why they aren’t great options, as well as some of the other options that are available to you if your credit isn’t the greatest. From them borrowing money and then lending it to you so the interest rate is lower, through to getting a credit card for people with poor credit and using it and paying it off in full every month to rebuild your credit. It is definitely worth a read so make sure you check it out now. ← Defence Discount Service – what is it and who is eligible? 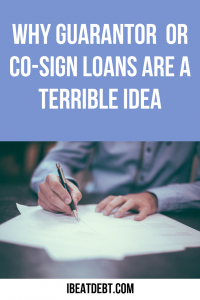 Ah, they’re called co-signer loans in the USA. Lots of parents have been burned by co-signing educational loans for their children. If something happens to prevent the child from repaying it, the parents’ wages or retirement funds are garnished to pay it off. Even their tax refunds can be intercepted!! Wow, that is terrible. Yes, I think they are awful, and I don’t think people realise the consequences that can occur in the long term!